This is a page in a little guidebook to Tallinn hand-made by my friend and colleague Stavroula Kounadea just before I headed to the Tuned City festival in Estonia to work on this. Stav’s guidebook was full of photos, drawings, hand-made maps and notes to help me find my way around Tallinn; she’d written about where I’d find a good coffee; where there were craft markets she thought I’d like; and what she felt I should specifically look out for on my adventures. 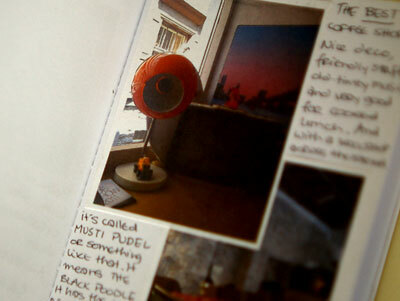 Its warm pages offered me a very friendly introduction to Tallinn. While working at Tuned City, I met Valeria Merlini. We ran a documentation workshop throughout the Tuned City festival – a collaboration that found us working together again at Audiograft in 2012, and which will see us working together this year at Tuned City, Brussels. The first field-recording Valeria and I made together was created at “The Best Coffee Shop in Tallinn” as detailed in Stav’s guide to Tallinn, where we went to record, to chat, and to plan our work for that day. 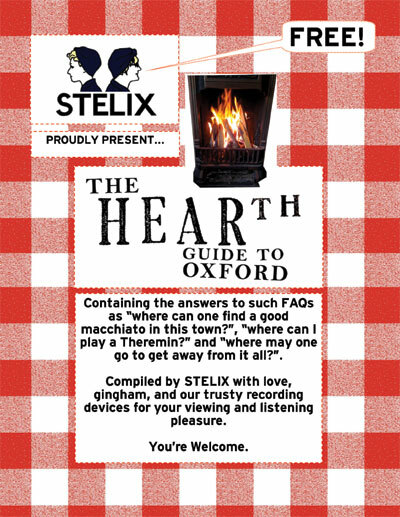 Stav and I have found new ways of working together too; this year’s Audiograft festival at Oxford Brookes sees us rolling up our STELIX work-sleeves to present a series of events entitled HEARth. HEARth is about how the little things – like making your friend a guidebook and like going for a coffee together – can sometimes lead to the big things – like forming International working partnerships and like making Art together. 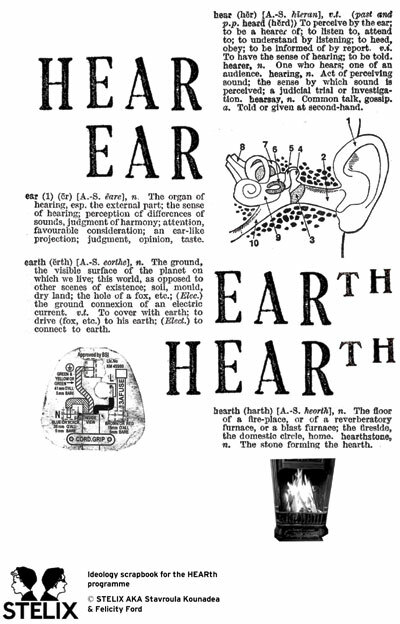 As the exaggerated HEAR in HEARth suggests, it’s also about listening together, and listening to one another, and therefore about exploring the social side of sound. Like Paul Whitty’s Berlin Sound Diary which created an art object out of the whole journey to Berlin, rather than focusing only on the concert performance that was ostensibly the purpose of that journey, HEARth celebrates the contexts around Audiograft, (the friendships, the hanging-out-afterwards, the eating, reading, and partying together) as well as the work that features in the main festival programme. …HEARth will happily also feature a Sound Diaries component called HEARth stories. Starting with The Best Coffee Shop in Tallinn which connects having coffee with making field recordings, working together, and looking after artists in strange cities, HEARth stories will document the everyday sounds that visiting artists attending Audiograft 2013 might experience in between performances, concerts and sound installations. Stay tuned for documentation of the soundworlds of Oxford’s finest pubs, interior spaces and walking routes, and for field-recordings celebrating the work of our field-recording comrades such as James Saunders and Kathy Hinde. The HEARth stories and recordings from the Sound Diaries archives will also be a focus in the forthcoming Audiograft/Sound Diaries podcast series, to be introduced here throughout Audiograft in between listening to the work, hanging out with other artists, eating sandwiches, making badges, and partying together at the end of the festival. Finally, Valeria Merlini has agreed to don her JD Zazie DJ hat and to custom-make us an Audiograft after-party mix to kick things off in our final HEARth event at The Jam Factory. It will feature many recordings from the Audiograft 2012 field-recording workshop we ran together in Oxford last year, (and maybe also the hissing of some wonderful espresso happening, all those months ago in Tallinn, at the genesis of HEARth…) so that the possibilities for sharing sounds, remembering experiences, and celebrating the dreamlike textures of soundartfestivalspace might continue finding new forms for expression.